This smart home occupancy sensor is designed to adjust device and appliance settings based on who is present in the room. Up until recently, convenience was defined as being able to talk to your appliances to control them. Today however, that’s old news. Home automation is increasingly becoming more advanced, and while devices can’t yet read our minds, they’re getting pretty close. 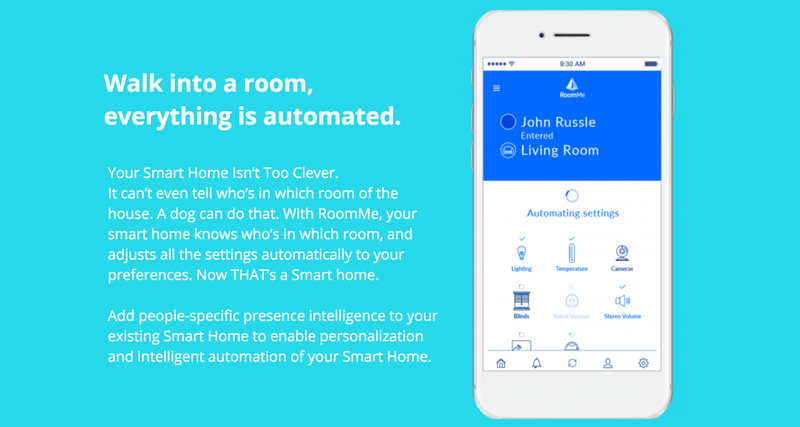 A startup called Intellithings is on the road to launching RoomMe, a patented smart home sensor that detects who has entered a room, syncs with smartphones and other smart home software, and leverages user data and customization to automatically adjust devices to serve preferences around things like temperature, lighting, entertainment and even security. The list of other controllable devices, as you would imagine in the IoT world, is quite extensive; RoomMe can be used to control TVs, lights, thermostats, lamps, cameras, coffee makers, ceiling fans, smart outlets, and window blinds. In essence if it’s a HomeKit, Wink, Nest, SmartThings, or WeMo device, you’re good to go. There’s also iOS and Android SDKs in the works which will provide additional access to functionality for developers. RoomMe can be activated in a few basic steps. First it’s mounted to the ceiling in any room. The sensor is then programmed to know which room it is located in. After that, the app controls the user’s smart devices–the ones linked via apps on their smartphone–using their preferences. Since RoomMe is designed to support multiple profiles, it does have functionality to handle multiple individuals in the same room. With priority settings, users can determine whose preferences actually apply to devices and appliances when more than one person enters a space. There’s also the possibility of compromising. For example, a thermostat can be set to a “middle of the road” temperature when two people are in a room, and then change back to the target temperature later on. As far as security goes, there’s no personal information required to use the device–all communication is done locally when possible–and RoomMe doesn’t accept commands from external devices. RoomMe is sized 15.2 cm x 4.5 cm, is designed to be mounted on the ceiling, and has a battery life of 2.5-3 years with normal use. At the moment, the device only works with smartphones and tablets with Bluetooth 4.0 peripheral capabilities, such as Apple iPhones, tablets, and newer Android devices. Earlier this year, the makers of RoomMe raised just over $40K via Indiegogo crowdfunding, most of the money coming through a single “Distribution Package” for $30K. The product has an estimated shipping date of May 2018, with pricing starting at $99 (16% off of expected retail). The Founder and CEO of RoomMe, Oren Kotlicki, has over 15 years of experience in the smart home sector. His work experience includes leading a company known as Visonic to be the first manufacturer to offer smart, cloud, home solutions. The company was acquired by Tyco International in 2011, after which Kotlicki founded Intellithings. Are these devices going to be able to get paired up with Alexa and Google Home? I would have loved something like this back when I was in college with all my geeky roommates. It would have been fun to test out the sensor and see what it can really do. That is a great point. Smart homes are not going to go away. Just like with the smartphone, things got more innovative and easier to use for people. It looks to me like these are about to start shipping in a few months. I wonder how long it will be before the bugs are all worked out and these home sensors work smoothly. You know full well that it will take a couple of cycles before everything works like it should. It is not a surprise today that we see so much tech get released before it is really ready for the real world. I am on the list for one of these devices and I cannot wait to see how it works. Because I am quite good with technology, I am going to get into this thing and really see what it can do, showcase it on YouTube for everyone to see! Having a smart home is going to be the new selling point for photographers. I wonder when builders will start to implement them into homes around America. Just by being able to handle more than one person in the same room is a pretty slick feature. I really like that. LOL I was about to say the same thing. Being able to walk into a room and maybe have the lights switch to a different color would be awesome! I already have a few devices like this. More automated virtual assistants, but would it be too much to ask that these all play together? This is awesome. The units that are really making a difference in the gadget world are really starting to make their way to the marketplace. I a little shocked that the price is that low. Even for the campaign pricing, that seems to be quite reasonable. Me too. I have another question. Do you think that it matters how large the room actually is? We see here that the RoomMe supports more than one profile, but how many is the max? Would it be able to recognize a family of 8 and maybe a few others that come around often? Gadgets like this are coming out faster than I can even decide if I want one or not. Amazon, Google and other companies are trying to automate everything, which is great, but I do not see ONE that has all the features I would like to see. Besides that fact that this product is pretty sweet and comes with a nice price tag, most of the funding came from one source makes me wonder. Does someone see potential and want to help spread the word, or does the company have a friend that just wanted to invest in the campaign, rather than the company itself? I noticed that as well. Maybe an investor that just wanted to help boost the campaign? I really like this gadget. I once heard that Bill Gates has a custom system like this for his home. When a person walks into a room, the art on the wall changes, the lighting changes, and even the music changes. Pretty sweet and now, just about any consumer can get a piece of this pie! Me too. The actual product has a small footprint, out of the way on the ceiling and has quite a bit of features for the user to navigate through. I am just struggling with how I would use something like this.